Little whirlpools with slight amounts of foam at their sides form as my paddle dips sideways into the golden water, forcing me smoothly ahead with every dip. The water gargling is the only sound unnatural to my surround dings, brisk gusty winds shake the trees and they creek and moan as the atmosphere purges itself of some sort of weather front moving invisibly yet forcibly across the land. The water has a murky look from afar, completely flat until my kayaks hull gently glides across its surface parting its murky surfaces to reveal white sand and sunken logs covered with moss just beneath its placid surface. So calm is the water in front of me that the reflection is picture perfect, showing the mossy pine trees, fern covered rocks and earth hills sitting right on the creek. The pine trees are producing this smell that is so Adirondack in nature I can just imagine myself hiking up one of the high peaks and just before the tree line is crested, that smell hits you, that decaying pine cone-needles smell combined with the stunted top of the mountain trees and the wind whipping the bald crag and all of the contents below the mountain can be smelled with the pine. Tree line pine I think to myself as I breath in heavily and exhale, the type of breathing that one who lives for the moment and truly appreciates their surroundings can truly enjoy. I pull my feet out of the kayak and stretch them out on top of the small red boat. I adjust my chair and just look up at the soft fluffy cumulus clouds that are being blown to the east rather quickly in this strong, weather fronted wind. I am protected from the wind, in this creek, actually a river though hardly so. No more then 10 feet wide and 1 foot deep in some places, the West Branch of the Sacandaga River is a paddler’s paradise. I was told about it last year and all year long while my kayak sat derelict on the side of my house providing a winter home for spiders and worms, I waited until kayak season began. On Friday I drove past the very place I was paddling now and thought that it looked so inviting, this little sliver of water could be seen from the road every now and then snaking its way through vast swampy plains surrounded by low lying hills and pine covered flatlands. Then yesterday Memorial Day, I was in my car blasting some live Alman Brothers Band trying to compensate for the humming of the straps keeping my kayak on my roof. 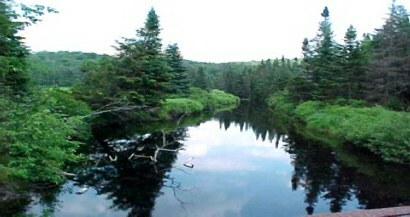 The West Branch of the Sacandaga River lies in the southern Southern Adirondacks just north of Caroga Lake, New York. The closest city is Gloversville- about 30 miles away. The road that it lies off of is Route 10, multiple parking spots are available to put in. I parked at the most crowded one- because I figured it was the best. Route 10 itself is a beautiful road with tons of swimming holes, kayaking and hiking trails and also has a large shoulder to ride a bike on. I kayaked upstream and besides the serenity which I noticed immediately, the scenery was amazing and constantly changing. The river itself is very clear when passing near the water, from afar it has a murky black water feel. Looking over the sides of my boat I could see multiple dead logs, rocks and water plants gently swaying in the hardly noticeable current, in fact I was leisurely paddling upstream with hardly any effort- besides the few beaver dams which had to be portaged. I tried in vain to paddle through their openings- but I lost being shot back out just as I crested the opening within the dam. At first I was surrounded by low lowing marsh and could hardly see out over it, little channels lead everywhere and I could see birds and small animals scurrying about as my slight wake slapped against the shore. The all of the sudden the marsh gave way to thick forest mostly pine and lots of lush ferns jutting out of the moss covered rocks on the shore of the river. Sand bars on the side of the water made for amazing summertime relaxing and swimming holes were abound. The topography of the river bed itself was amazing. Despite its narrowness it was quite deep in some places and it was interesting to see how it was 10 feet deep and all of the sudden the bottom of my boat gently hit sand bars. The sand was beautiful and made for great walking if someone wanted to get out and splash around in the stream. Only towards the end of the road for upstream paddling did any rocks appear. The scenery was amazing as was the solitude despite the fact the road could never have been more then a half mile from where I glided swiftly along the placid black surface. I met some nice people from Northville and had a lazy afternoon chat about different paddling spots in the southern Adirondacks. I like the southern Adirondacks better, because the downstate folks who make the trip usually go north leaving the south to locals and the less rowdy types who usually venture north to the Saranac Chain Lakes Region. The told me about a lake I could hit up on the way back downstream and about a few creeks in the Great Sacandaga Lake area. On the way back downstream I took the couples advice and took a turn at this one little side creek. Soon the trees were replaced by marshes, but this time the marshes were very low and gave me a full vantage point. I could see a few miles in either direction and was amazed to find I was surrounded by some mountains and one of them had a bare rock cliff. In the foreground were some awesome swamps with half dead pine trees and lots of bushes and water plants. The stream was very narrow to get to the lake and once I got there the wind picked up a lot in the open area. So windy was it that I noticed I was paddling and not moving so I turned around. I got out of my kayak and put it on the roof of my car, my muscles felt great and it was the first upper body workout I had gotten in ages. The wind was slight and the sky was bright so I took my road bike from my trunk and decided to take a ride. I ended up riding 11 miles north on Route 10, to the Piseco Lake Outlet otherwise known as Big Bay. This another beautiful paddling spot I have noticed and if not for the wind creating choppy conditions I would have kayaked here as well. I sat on the shore and took a nap as I listened to the waves lapping the shore and the wind swaying the trees. This site has a list of many canoe and kayak spots in the Adirondacks and I find it to be very useful. This entry was posted on May 29, 2007 at 3:01 pm	and is filed under Adirondacks, Kayaking, Road Biking. You can follow any responses to this entry through the RSS 2.0 feed. You can leave a response, or trackback from your own site. You write beautifully, as if the reader is right there with you. I admire your spirit of adventure and am going to buy my first kayak this year. I’m very excited! My son, Nick, has finally talked me into it. This blog is definitely inspirational, thanks for sharing. Glad I can be of some inspiration. You can largely eliminate “strap hum” by having a half twist in the strap when it passes over the cockpit hole. Kayaking helmets should be high quality and fit comfortably. A kayak and paddle, life jacket, helmet and spray skirt are the advise fundamentals. spare paddle, and a buoyant heaving line. credit car loans, no money down, alternative lending. purchase orders and letters of credit. rented for minimum 7 days. All the hotels provide daily housekeeping services to the guests. can be enjoyed by people of all ages. more leisure time exploring the city and enjoying its many interesting sights and sounds. notes that water is a foundation of life. All temporary exhibitions with admission fees are hosted in level 4.